Pi, the ratio between a circle's diameter and circumference, has fascinated mathematicians since antiquity. Pi, which cannot be expressed as a ratio of two whole numbers, is an apparently endless string of digits approximately 3.14159… Pi is not "random" in the strict sense, because individual digits are mathematically fixed (modern computers have enabled mathematicians to calculate the value of pi to more than 13 trillion digits). But no evidence has yet been found that an increasingly accurate value of pi will ever reveal an end to the string or that there is any regular pattern to be found within it. Greek philosopher Plato first observed that no perfect circle exists in nature, as a perfect circle is a geometrical idealization. But nature's near perfect circles are a constant reminder that pi is transcendental in both senses of the word. In the First Book of Kings, details of Solomon's Temple include the measurements of a "molten sea", or cast metal sea used for ritual baths. The dimensions of ten cubits diameter and thirty cubits circumference give only a rough approximation of pi (30/10 = 3) although others have speculated about a more accurate interpretation from this verse. But there is a far more accurate (albeit somewhat more tedious) method of calculating pi in the Bible. It can be found using the gematria values from the very first scriptural verse (Gen 1:1). This verse has 7 Hebrew words with a total of 28 letters. By dividing 28 times the product of the letters by seven times the product of the words, an approximation of the value of pi is given to an accuracy which wasn't surpassed until 499 AD by Chinese mathematician Zhou Chongzhi who used the fraction 355/113, and was not achieved in the West until the 15th Century. This formula gives an approximation of pi correct to five significant figures. The odds of obtaining this degree of accuracy using a random number generator are 10 x 10 x 10 x 10 x 10, or 1 in 100,000. The Feynman Point is an improbable sequence of six 9's beginning at position 762 after the decimal point in pi. The odds of a repdigit of this length starting this early in pi's sequence is about 1 in 130 using the formula 1-(1-0.1⁶) ⁷⁶⁷*10. The most obvious of nature's circles are the two great lights created on the fourth day in the Book of Genesis. The first mentioned reason for the creation of these great lights were that they should be for signs. The Hebrew word for signs is owth (אות) Strongs H226, which has a gematria value of 407 which is a divisor of 999999. Proverb here refers to a common saying among the people. Ezekiel's oracle affirms the imminent fulfillment of God's visions and challenges those who proclaim false messages of peace. The improbability of the string of nines so early in pi is surpassed by a similar sequence beginning at position 761 after the decimal point in 2π. This time, the sequence extends to seven 9's. The odds of a repdigit of this length so early in a random string are about 1 in 1,300 according to the formula 1-(1-0.1⁷) ⁷⁶⁷*10. Even more remarkable is the second string of 9's occurring so soon thereafter. There are 31,102 verses in the Bible, so how strange that the intermediate numbers lead to the very next verse, to provide context to Ezekiel's oracle. Click here for an irrational number search engine (opens in new window). There is also a 99 repdigit following shortly after the Feynman Point in pi. Again, the intermediate digits carry with them a portent. In Acts Chapter 27 Paul was shipwrecked on his way to Italy to appeal to Caesar. After surviving a raging storm, the ship struck a sandbar and began to break apart on the island of Malta (Melita). The centurion commanded that they who were able to swim should cast themselves first into the sea (εξιεναι), and get to land (Acts 27:43). The rest scrambled to shore on boards, and miraculously all 276 on board the ship were saved. Within the first thousand digits of pi, there are four 3 digit numbers which each occur five times. Those numbers are 105, 171, 446 and 609. Frequency distribution of 3 digit numbers. For example, 367 3 digit numbers do not appear within the first 1,000 digits of pi. As can be seen from the distribution table, it's rare for any 3 digit number to occur more than five times within a string of 1000 random digits. We have already seen one such occurrence with the remarkable string of seven 9's in 2π, followed shortly thereafter by 999. This totals to 6 appearances of 999 within the first 1000 digits of 2π. It's more likely for a 3 string repdigit to appear more frequently, because 999 has a one in ten chance of becoming 9999 (which would count as two appearances of 999). A non repdigit, on the other hand, has to start all over again with a one in a thousand chance of recurrence. It thus becomes even more remarkable, that the sixfold appearance of a three digit number within the first 1000 digits of 3π is a non repdigit. One number among a thousand. Three unusually specific numbers in the Bible have long been the subject of intrigue. Those numbers are 276 (souls saved in the shipwreck), 666 (the number of the beast) and 153 (the number of fishes caught in the net). Adding to the intrigue is that all three of these numbers are triangular, whilst 153 and 276 are also hexagonal. Hexagonal numbers are a subset of triangular numbers. All hexagonal numbers are triangular, but not all triangular numbers are hexagonal. The number 153 appears once within the first thousand digits of π, and not at all within the first 1000 digits of 2π. No surprises there. But then a friend advised a check of 3π, on account of the Trinity. Surprisingly, 153 has 6 appearances within the first 1000 digits of 3π. In the final chapter of John's Gospel, the disciples decided to go fishing, recalling their previous occupation but also symbolizing their new role of gathering believers. After an unsuccessful night and just after daybreak, the resurrected Jesus appeared to them for the third time since he was risen from the dead. 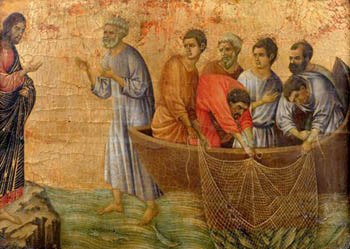 He instructed them to cast their net on the right side of the boat, whereupon they caught 153 fishes in the net. It seems strange that Simon Peter firstly dresses, and then jumps into the sea (John 21:7). But recall the 276th word in the Hebrew Bible which is בימים (in the seas) Gen 1:22. The six appearances of 153 in 3π begin at positions 17, 123, 443, 596, 645 and 888 after the decimal point. The miraculous catch of 153 has been depicted many times in art, and the boat on the water can be represented by an 18 piece jigsaw featuring familiar triangular numbers 153, 666, and 703. The triangular number 5778 is the 18th Lucas number and the golden ratio raised to the 18th power. Like 153 and 276, 5778 is also hexagonal. 5778 is one of only three 4 digit numbers to appear three times within the first 1000 digits of pi. The second and third occurrences are separated by the number 18. A similarly appropriate aquatic scene is possible using fewer jigsaw pieces to construct the 5778 jigsaw. Sound advice, but this verse is also part of the pi narrative. The first appearance of π in the scientific literature was in 1706 in a paper entitled Synopsis Palmariorum Matheseos (A Summary of Mathematical Achievements) by William Jones of Britain. It is thought that he (Jones) chose π either because it is first letter of the word for periphery (περιφέρεια) or because it is the first letter of the word for perimeter (περίμετρος). Or perhaps because of both. The first word of Mat 24:36 (περι) also begins with the Greek letter π. There are 22 letters in the Hebrew alphabet. The first occurrence of 22 in pi is followed by the three digits 317. In the original Greek New Testament, αμην (amen) has a numerical value of 99. The word αμην (amen) is also translated as "verily" when it appears at the beginning of a discourse. The number 317 can be partitioned as 31 and 7. 317 is the 66th prime. In both pi and phi, the string 66 occurs once in the first 137 digits (beginning from positions 211 and 123 respectively. In contrast, the string 66 occurs 6 times within the first 137 digits of e.
But why stop there? Repdigits are always interesting, and little fish are sweet. The 11th, 22nd, 33rd, 44th, 55th, 66th, 77th, 88th and 99th prime numbers are 31, 79, 137, 193, 257, 317, 389, 457 and 523 respectively. The 153rd prime number is 883. Beginning from position 883 in pi are the 5 digits 42061, the 4398th prime number. Beginning from position 888 in pi (following 42061) are the four digits 7177. Beginning from position 153 in pi is another repdigit, 111. There are 153 Hebrew words in the first 12 Bible verses. The 12th prime number is 37, which is the common divisor of all three string repdigits. Within the 12th verse is the Bible's 137th word הארץ (haEretz, meaning "the earth"). The 935th Hebrew word in the Bible is הנחש (haNachash, meaning "the serpent"), when the woman said, The serpent beguiled me, and I did eat (Gen 3:13). The guile of the serpent effectively ended the Edenic covenant, which was replaced by the Adamic covenant. The 358th Hebrew word in the Bible is ומלאו ("replenish"), when God said, Be fruitful.and multiply, and replenish the earth, and subdue it: and have dominion over the fish of the sea ... (Gen 1:28). The word נחש ("serpent") is Strongs H5175 which is translated 31 times in the Bible (KJV), the 11th prime number. The digits of 153 sum to 9. The "pi verse" in John's Gospel is the 9th appearance of "the serpent" in the Bible (KJV). Approximations of pi can also be located within the pi string itself (after the decimal point). The first ten digits of pi are not to be found within the first 2 billion digits after the decimal point, but the first appearance of 314159265 begins at position 1,660,042,751. The first occurrence of 31415926 begins at position 50,366,472 after the decimal point in pi. The first occurrence of 3141592 begins at position 25,198,140 after the decimal point in pi. Christ the Redeemer by Andrei Rublev (ca. 1410, Tretyakov Gallery, Moscow). The word "Messiah" appears twice in the Tanakh, and also twice ("Messias") in the New Testament. The probability of finding a 9 digit string within a random string of 2 billion digits is about 86%, whilst the probability of finding a 10 digit string falls to 18%. The first 10 digits of pi (3141592653) don't appear within the first 2 billion digits of pi. The only 10 string repdigit to appear within the first 2 billion digits of pi is 6666666666, which begins at position 386,980,412 after the decimal point. Rev 13:18 (verse #30927) appears 21,833 verses after 1 Ki 10:14 (verse #9094). In the Book of Revelation, 144,000 are the number who will receive the seal of God: 12,000 from each of the tribes of Juda, Reuben, Gad, Aser, Nepthalim, Manasses, Simeon, Levi, Issachar, Zabulon, Joseph and Benjamin (Rev 7:5-8). With a slight grammatical modification (you be the judge), the nominative spelling of these twelve tribes sums to 8880. The seal of God that will protect the 144,000 chosen is associated with the mark (אות) that protected Cain from his pursuers in Gen 4:15. This Hebrew word owth Strongs H226 is translated a total of 79 times in the Bible as signs, tokens, miracle or mark. The equivalent word in the Aramaic sections of the Tanakh is את, Strongs H853 (aleph tav, the first and last of the 22 letter Hebrew alphabet). The Aramaic word את ("signs") is translated three times in the Bible, all in the Book of Daniel. The first of these is the words spoken by Nebuchadnezzar in Dan 4:2. "I thought it good to shew the signs and wonders that the high God hath wrought toward me."